Every semester in my early World Civilizations class I teach a unit on the migrations that populated the Americas and Oceania. In the last decade advanced DNA research has thrown traditional migration theories into question. My recent involvement with the Joint POW-MIA Accounting Command (JPAC) and the Armed Forces DNA Identification Laboratory (AFDIL) on the Wake Island mission has raised my interest in genetic research and the corresponding moral dilemmas that attend it. DNA testing of human remains can reveal a wide range of historical data from personal identity (as in JPAC’s missions to locate, identify, and bring home those who died in our nation’s wars) to cultural identity (as in scientific studies to identify the age and markers of Paleo-American skeletons to better understand our hemispheric history). The question is: should science trump familial rights to privacy and cultural belief systems, or should the dead be left to rest in peace? I have been following recent developments in Paleo-American research here in the Northwest with great interest. Two cases in particular place the scientific/moral dilemma in sharp focus, but I’d like to offer a back story first. While most of my blog posts connect one way or another to Wake Island, I have to claim “six degrees of separation” for this one. The severely depleted native population was in no shape to mount a hostile attack on Wilkes in 1841. Contact with white explorers and traders had exposed the tribes to diseases like influenza, malaria, and smallpox, to which they had no immunity. The epidemic diseases spread like wildfire, decimating tribal populations. 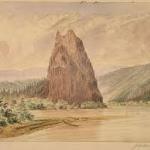 Prominent Chinook Chief Comcomly was among scores who died of the “Cold Sick” in 1830 and was buried on Memaloose Island, upriver from Mount Coffin. A British doctor with the Hudson’s Bay Company, Meredith Gairdner, located the site, decapitated Comcomly’ s corpse, and sent the skull to England for scientific study. Careless desecration of grave sites by whites and outright looting for skulls, body parts, and artifacts occurred frequently in the Northwest during the 19th century. The popularity of “racial science” and phrenology – measurements of skulls to interpret racial and behavioral characteristics – fed the demand for skulls in particular. The heads of Columbia River and North Coast Indians had special allure as these tribes practiced cranial deformation, binding their infants’ heads to create an elongated skull as a mark of nobility. Whether for morbid curiosity and public display or justified by scientific study, grave robbery deeply distressed the Indian communities: ancestral burials were sacred grounds. The skull fetish abated, but for many decades well into the 20th century collectors raided Indian burial sites for artifacts that filled natural history museums across the nation. After many decades of this cultural abuse, the tribes achieved the Native American Graves Protection and Repatriation Act that became law in 1990. NAGPRA requires federal agencies to return cultural artifacts and skeletal remains found on federal lands to lineal descendants or tribes with cultural affiliation. While the law does not apply to state or privately held lands, any connection to federal funding obligates repatriation. In recent years advocates of repatriation have achieved success based on moral obligation even where there is no federal obligation. In 1968 the skeletal remains of a young boy were found on private land in Montana. His skull, bone fragments, and over a hundred spear points, blades, and other artifacts buried with him were analyzed over the years. The Clovis spear points corresponded to the first known, widespread, indigenous North American culture dating to about 13,000 years ago: “Anzick Boy’s” grave is the oldest found in North America. With new DNA technology scientists dated the boy’s remains to 12,700 years and in 2014 they achieved the first sequencing of the full Paleo-American genome. This accomplishment was due in part to the fact that the ancient grave was found on private, not federal, land, and the remains were thus not subject to NAGPRA repatriation after 1990. With the genome sequenced, however, Anzick Boy was reburied with tribal ceremony and honors in September 2014. Additional recent discoveries of remains and radio-carbon readings of organic material in Central and South America have combined to push back traditional theories of first migrations by several millennia. The last ice age lowered sea levels and exposed land bridges linking East Asia/Russia and Alaska, the bridging territory known as Beringia. Migrants moved into the Americas by land and coastal sea routes until global warming submerged the transit zone. The new research suggests earliest migration occurred 15,000 years ago or more and that some of the first migrants traveled the farthest, reaching the tip of South America. Alternative origins of those early migrants are also considered, rejected, and reconsidered on a regular basis. In 1996 hikers discovered what turned out to be a Paleo-American skeleton on the bank of the Columbia River near the Tri-Cities in Washington State. Scientists determined that “Kennewick Man” was in fact 9,600 years old. Controversy erupted immediately as the Umatilla Confederated Tribes, supported by the Corps of Engineers, claimed ownership of the ancestral remains for reburial under NAGPRA. Scientists argued that Kennewick Man offered an unprecedented opportunity for new Paleo-American research. After eight years of litigation the scientists won in 2004, retaining the right to study the remains due to their extreme age and no clear link to existing tribes. Kennewick man’s skull shape and other features showed differences with modern Native Americans, suggesting alternate origins to the long-accepted Asian migration. Speculations included ancient Japanese or Polynesian peoples. Newer research suggests genetic mutations occurred after arrival in the Americas, which bolsters tribal claims to Kennewick Man as an ancestor. The prolonged controversy continues. I have to say that I am fascinated by what DNA research can do and what it brings to historical revisionism, but I also respect the right of the living to let their dead rest in peace.